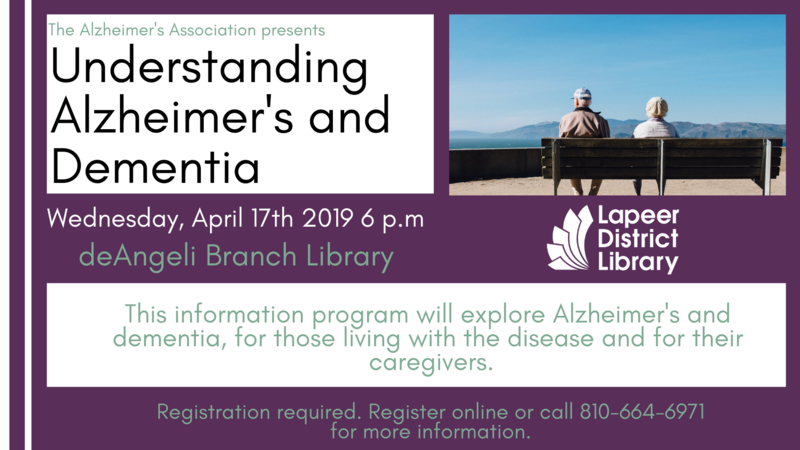 The Alzheimer's Association Presents Understanding Alzheimer's and Dementia on Wednesday, April 17th at 6 p.m. Registration is required. This program will help those affected by the disease and their caregivers about how to navigate the illness and resources that are available. The one-hour program will explore the two diseases and what happens in a brain affected by Alzheimer’s. The program will also detail the risk factors and the general stages of the disease and FDA-approved treatments to symptom treatment. Participants will learn what's on the horizon for Alzheimer’s research and learn more about how the Alzheimer’s Association helps those affected by the illness and their caregivers. For more information, please call the deAngeli Branch Library at (810) 664-6971.